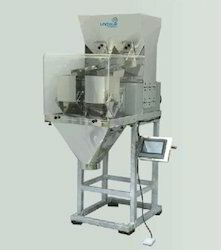 The Semi Automatic Pouch Filling Machine from the Unique packaging Systems are a machine of great technical prowess and international repute. Our assortment also includes a lot many customization offers that make our assortment a master class due to its utility in the end. Additionally, we promise a tenable run on the machines, as it stays strong after even the most rigorous runs. Linear weigh filling system is a loadcell based filling technology to pack the material with weighing. 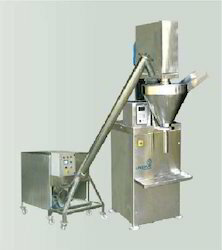 Linear vibratory feeders are used to feed the material from the storage hopper to the weighing pan. The electronic control panel consists of a sophisticated electronic hardware and software control the rate of vibration and continuously measures the weight that falls inside the weighing pan. Intially in the coarse mode the vibration/feed rate is high and the material flows into the weighing pan at a high speed. Once the material in the weighing pan reaches nearly 80% to 90% of the target weight the machine automatically enters in the fine mode where the material trickles down and the vibration finally stops as soon as the target weight is achieved. The weighted material is then dropped automatically or by pressing a foot switch in the final packet/carton. This system is called A single head weighing machine and by this single head machine 6 to 10 fills can be taken per minute. For more speed the number of weighing head can be increased. APPLICATIONS:- Highly suitable for :- Pulses, Wafers, Dry Fruits, Tea Powder, Candies, Namkeen, Whole spices, Seeds and Detergent Powder etc. UNIQUE PACKAGING SYSTEMS offer Auger Filler for Milk Powder, Ground Spices, Pesticides, Mehndi, Chemical, Coffee. 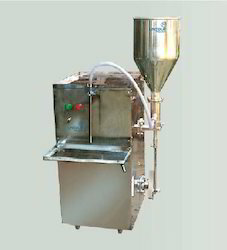 These are highly suitable for Milk Powder, Ground Spices, Pesticides, Mehndi, Chemical, Coffee etc.Application of Auger Filling Machines: Suitable for Flours, Turmeric powder, Chilli powder, Pesticides powder, Mehandi powder or any type of fine powders etc.Out put: 15 fills/min to 60 fills/min (subjected to model & gramage)Operation: Mechanical Control: Electronically or PLC controlled.Auger Screw operating system: CBC driven or Servo driven.Packaging material: Any ready pouches, Jar, Containers etc. UNIQUE PACKAGING SYSTEMS offer Semi Automatic Powder Filling Machine for Powdered Substances, Granules, Tea, Coffee, Dhana Dal, Tablets, Nameen. These are meant for various Powders, Granules, Tea, Coffee, Tablets, Dhana Dal, Namkeen etc.